When you have to go out with your friends to a big place where you know people are going to dress up as best possible, you would not want to go there dressed like a cheap person. You will dig through your closet to find something stylish and cool. This is the most stressful thing that can happen to a person when they have a lot of outfits to choose from. Looking good is everything nowadays because people pay attention and then looks at how they can adapt it to their lives. And, they do talk about it because inspiration can come from anywhere. A person praising your sense of dressing is the best feeling you can have. The same scenario can be applied to make your house appealing to your guests for dinners or any other occasion. It’s the best feeling when you bring your friends and family to your place and then receive compliments when they observe how beautifully you have decorated your rooms. 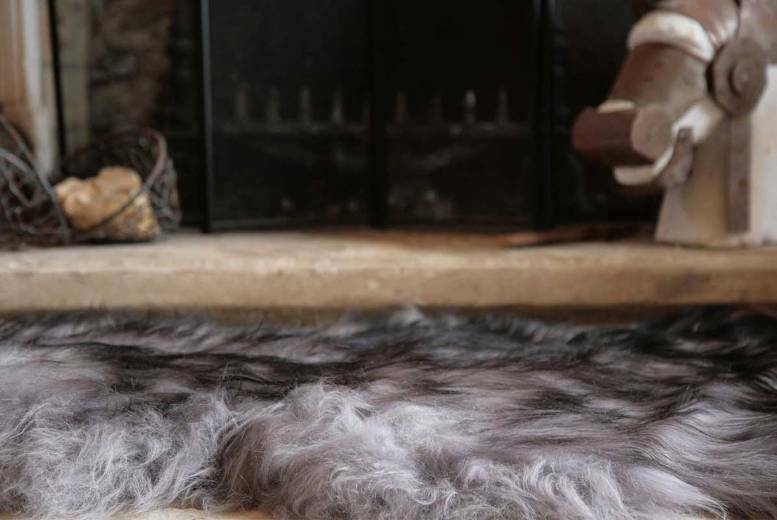 Now for those who have not got that moment yet, there is an opportunity you can avail now and that by the help of these Sheepskin Rugs which are made present in this online store. They are crafted with a creative touch, along with amazing designs and colors that made it more outstanding. These here are of high qualities and can be placed at any location of your rooms you feel like, even on your sofas, chairs and inside your car as well. There are even patterned ones that are appealing and also these sheepskin rugs happen to be flame resistant. They can be washed with warm water in case of some stains made on rugs. Furthermore, they are so furred and so comfortable, that you can rest on it and read a book or work on your laptop. If it helps, you can put your baby to sleep on that as it is very comfortable for a small sheepskin rug to be put in the cot. Some people prefer putting them on the beds and the chairs for more comfort for the back. 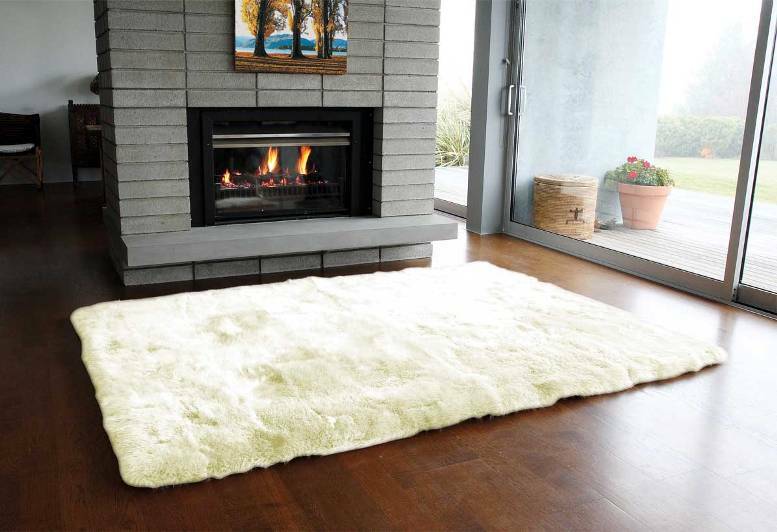 These colored, black and white faux sheepskin rug are designed accurately which also you get provided in the same way. Sheep fur is the most comfortable thing you will ever find and touch. It is so soft and comfy that you would not want to stop touching it. This is why they make such good real sheepskin rug and highly preferable. Just by looking at them in the stores, you immediately want to buy them. Anything that you buy, it needs to be taken proper care of, and that is very important with these lavish decoration items. If you want your gorgeous rugs to last for years, then you have to be very tender and loving with them. It is not because they are going to cry but these will determine how welcoming your house actually looks. If you are happy with a clean and posh looking rug at your bedside or fireplace or on the sofas, then your guests will be too. It was always going to be a stress for every first timer when they purchase or are gifted with a rug. Knowing the quality and the hard work that is gone into creating this, anyone would know that simply washing it was not going to do the trick. Some genuine sheepskin rugs are quite expensive, and some are reasonably priced as you can see in our store, but that does not mean they need a careless wash. Just like in certain clothes you are not allowed to use the machine or detergent or rough wash, the same way the rugs need extra care. This is how you can take care of your sheepskin rug, regardless of how old and the condition it is in. 1. An old rug will have tangled fur, and it will certainly have dust and mud and all the particles that you usually find in a carpet. The fur will also become hard and stiff. In order to make things manageable for you, it is highly recommended that you brush the rug, so it becomes less hectic when you wash it. You have to brush it to remove the tangled knots to get all the dirt out while washing. 2. Even though it is alright to wash your small rug in the washing machine, using your hands gives a more safe feeling that you know what you are doing and is less risky. You can use the sink or the bathtub depending on the length of the rug. 3. The water’s temperature should be lukewarm. The temperature should be 38°C. That is 100° in Fahrenheit. 4. It is highly advised that you use shampoos and detergents that do not have alkaline. Tide and other detergents are prohibited. If you do not have access to that, then your alternate option can be to use a mild liquid detergent. Since the rug always has leather at the bottom, a regular wool wash is not good for it. Therefore it is important to get the precise thing. 5. Of course, you can’t afford to be too rough with the washing by using your hands. After you have brushed your rug, the dirt should come off easier. All you have to do after putting the detergent is just simply to move the sheepskin area rugs around for five to six minutes. The objective is to be very fragile with it. If you have a technology upgraded washing machine, then choose the wool cycle setting on it to wash your rug. 6. The water is going to turn brown by now, and that is a sign that you have to take out your rug from it, drain the water out, and fill clean lukewarm water. Before you refill the water, makes sure you get as much dirty water out as possible by soaking it in and out. You may have to repeat this technique twice till it becomes clear that the dirt is gone. 7. After you are satisfied with the cleanness of the rug, you can take it out and start to drain the excess water by putting in the machine. A five-minute spin is enough to remove the water and make it dry enough to the next step. 8. After you did that, take out the rug and straighten it so that leather takes the initial flat shape. To dry the rug, use a towel and lay it on top of the fur or vice versa. Do not make the mistake of keeping it in the sun to dry it faster. The sun will make the leather stiff, and you will feel uncomfortable when you touch the rug. Your rug is supposed to be flexible, not rigid. Just keep your rug in a place where excessive heat is not close to it. Patience is the key in this. 9. While the fur is still damp, run a metal brush gently on it to straighten the fur and prevent it from tangling. When the wool is completely dry, brush it again, so it gives the fluffy outlook. In no time, you will find your rug looking it is new instead of being a couple of years old. You do not have to be rough with brushing. 10. The liquid that you must use for your rug may come with a special brush. If it does not, then you can buy one since any metal bristles brushes will do. These are the 10 points that you should keep in mind when you have to clean your sheepskin rug. However, there are people who own rugs that are more than decade old. They can follow this guide as well, but it is no guarantee on the rug looking as good as new. If it stays tan or yellowish after you followed the process, then it is because of the sun’s rays, which is impossible to be reversed. It is better that they invest in a new rug because the old one may have the leather fibers fall apart, and that is not a good sign. The leather is the reason your mat maintains its grip. Not to forget, there are also rugs that are dyed. They too have a different system of maintenance. Those who own a dyed sheepskin rug can give it for dry cleaning. If you choose to wash it in the machine, the color will definitely come off, and it will leave an ugly patch or patches on the rug. An important fact about colored sheepskin rugs is that the leather at the back is either white or blue-ish green then that it means it is natural. The color of the leather on dyed rugs is kind of similar to the color of the wool. Hopefully, you will follow these ten very crucial steps to make sure that your rugs stay dirt free and look fresh for people to compliment you on it. Do not forget to pass on this valuable information because by judging on the prices of the rugs these days; you will see one in every house that you go in. It is always helpful to pass on these tips and make use of them as well. Surely, you have experienced how a rug will make you feel after you rest your legs or your whole body on it. It is not a massage mat, but the softness and the fur are enough to make you feel like you are sitting on a cloud. These rugs are in every luxurious mansion in films and television series. But there is a good chance that you can get one for your home courtesy of this online store. There are various shapes and colors that you can choose to suit the room or area you want to place it. The color of your room plays a very important role in deciding how well and which dyed rug will be the perfect combination. That is why you should actually focus on is on picking the color. There are double pelts and white sheepskin rug styles that are presented in various shapes like a cloud or just like a simple rectangular mat. Just like how leather has two types, real and PU, these have two kinds but in sizes, small and large faux sheepskin rug. Nonetheless, whatever you decide on buying, the result will be the same. Although there will be a little difference, it will not matter when you will feel it. Their main purpose is that they will brighten up your rooms and your guests will truly admire the way you plan, decorate and maintain your house. By laying a lasting impression like that you will certainly become popular and people will admire your personality even more. You do not need to have a three story house to consider yourself luxurious, a rug can do that for you. 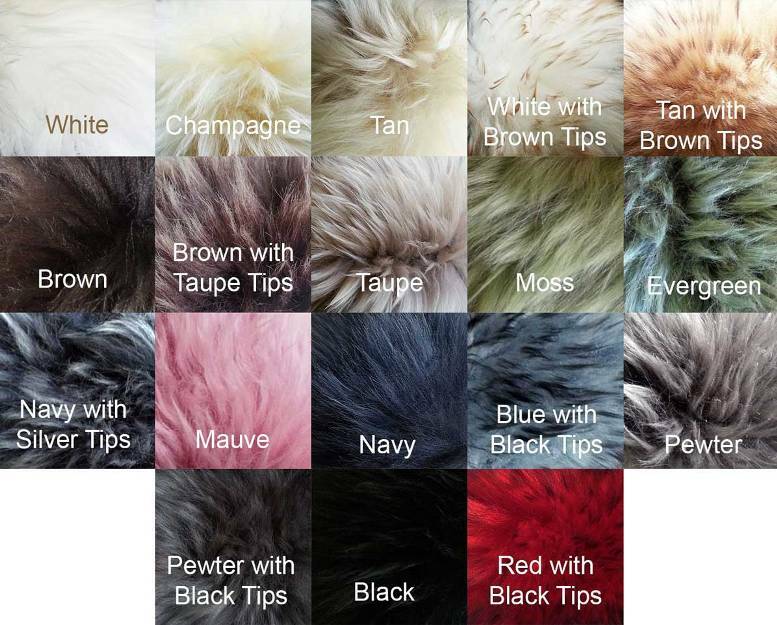 Check it out, select your favorite sheepskin rug sale and place your order. 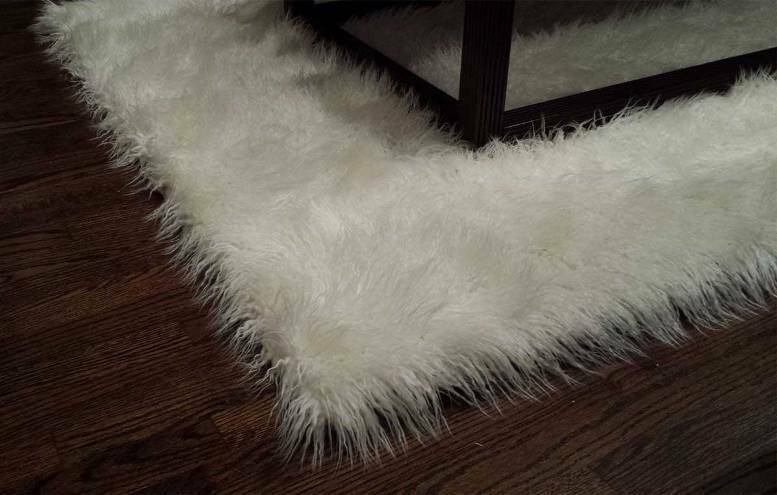 Those who want a less furry decor item then they can click here to visit the collection of cowhide rug.